Although you might be tempted to go with off-the-shelf treatments because of their seeming cost savings, consider this: Custom blinds, shades, sheers, shutters, draperies and curtains will not only reduce your energy bill, but will add a custom look that will set you apart from everyone else. 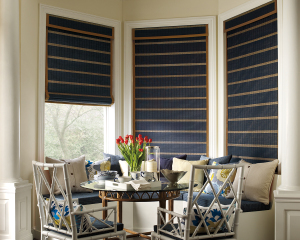 Ready-made or off the shelf window treatments are limited in sizes, colors, styles, textures and functions. With custom window treatments, the possibilities are endless. You can mix and match fabrics, colors, textures and options. Hunter Douglas has blinds, shades, sheers and shutters to transform any window into a work of art, including the exclusive Alustra® Collection – an extraordinary collection that defines beauty and the quintessence of a home. Too often, off-the-shelf treatments won’t actually truly fit in a window. That is because window openings are not always perfectly square—in both new and old construction. Specialty shaped window pose an even greater challenge. When a professional installer measures your windows, he or she will take three measurements to ensure that your new window treatment will fit perfectly. They will also determine whether mounting inside the window opening or outside the window will be for your window and your lifestyle. As much as 50% of a home’s cooling and heating can be lost through the window. Hunter Douglas, the industry leader in custom window treatments, considers the impact their window treatment products can contribute to saving energy at the window. In particular, they look at how the treatment will transform natural daylight, reducing the need for artificial lighting. They’ll also look at controlling solar heat for energy efficiency in winter and summer. As your local Hunter Douglas gallery, we carry the exclusive Duette® Architella® honeycomb shade. With its honeycomb-within-a-honeycomb construction, this is the most energy efficient shade on the market today.